The Earth's ocean-atmosphere system was technically in an ENSO-neutral state during May 2017. The weather over the contiguous United States (CONUS) this month was dominated by a highly variable jet stream circulation which sent many closed lows, fronts and low pressure systems across the country. The weather systems dropped above-normal precipitation across much of the eastern half of the country, especially from the Lower Mississippi Valley to Ohio Valley and central Appalachians. The heavy rains reduced drought from the Lower Mississippi Valley to Northeast, but persistent dryness expanded drought in parts of the Plains and Southwest. The fronts and upper-level lows triggered bouts of severe weather and kept temperatures cooler than normal across much of the central CONUS. The upper-level circulation, temperature, and precipitation anomaly patterns suggested the atmospheric drivers originating in the mid-latitudes, specifically the North Atlantic, had the greatest influence on the month's weather. See below for details. In the Northern Hemisphere, May marks the end of climatological spring which is the time of year when solar heating increases with the rising sun angle, arctic air masses are not as cold, and a contracting circumpolar vortex forces the jet stream northward. Polar air masses influence the weather over the contiguous U.S. (CONUS) less, and the warm, dry subtropical high pressure belts influence the weather more. Like April, May 2017, however, did not follow the usual climatological script. And like the previous month, a highly meridional and variable upper-level circulation sent many troughs and slow-moving closed lows across the CONUS which left bouts of cooler weather, heavy precipitation, and severe storms in their wake. Precipitation was brought to many areas at various times during the month (weeks 1, 2, 3, 4, 5), especially east of the Rockies. Above-normal precipitation gave eight states in the East and South the tenth wettest, or wetter, May in the 1895-2017 record. The slow-moving nature of the closed lows and their southerly flow funneled Gulf of Mexico and Atlantic moisture into the southern and eastern CONUS, with parts of the southern to central Appalachians having the wettest May on record. This overall circulation pattern and its widespread above-normal precipitation in the east gave the CONUS the 25th wettest May on record. Cold fronts and low pressure systems combined with the upper-level lows to create unstable air and dynamics favorable for severe weather. Based on preliminary data, there were 290 tornadoes in May 2017, which is about the May average of 276. Most occurred in the southern and central Plains to Midwest and Southeast where Gulf of Mexico moisture was drawn in to the powerful upper-level troughs and surface fronts and low pressure systems. A particularly strong and widespread severe weather outbreak occurred at mid-month. While it dropped a blanket of snow across Colorado and Wyoming, the upper-level low and its associated surface low and frontal system pulled in warm, moist, and unstable air into the southern and central Plains. This combined with the clash of air masses and twisting of circulation with height to trigger dozens of tornadoes in the Plains on the 16th to 19th (severe storm reports for May 16, 18, 19). The southwest-to-northeast movement of the upper-level systems produced a pronounced pattern of wetter-than-normal streaks. For areas not in the path of these weather systems, the month ended up drier than normal. Eight states in the Plains and West had below-average precipitation for May. The above-normal precipitation helped shrink drought and abnormally dry areas across much of the Southeast to Northeast and parts of the central Plains and Hawaii. But the deficient precipitation expanded or intensified drought and abnormally dry areas in the northern and southern Plains and parts of Florida and the Southwest states. As a result, the national moderate-to-exceptional drought footprint increased slightly from 5.0 percent at the end of April to 5.3 percent at the end of May (from 4.2 percent to 4.5 percent for all of the U.S.). The drought was especially severe in Florida, the only state to have drought in the extreme (D3) category. Several large wildfires burned throughout the month in Florida as well as parts of the Southwest (wildfire maps for May 5, 19, 31). The CONUS was not affected by any tropical cyclones during May 2017. This is not surprising, since the Atlantic hurricane season runs from June 1st through November 30th and no tropical systems developed in the North Atlantic during May. The Eastern North Pacific hurricane season runs from May 15th through November 30th, and two tropical systems developed during May: Tropical Storm Adrian which lasted only two days (May 9-10), and Tropical Depression 02E which formed on the last day of the month. No tropical systems developed in the western Tropical Pacific which affected any of the U.S.-Affiliated Pacific Islands in Micronesia. While deep closed lows and upper-level troughs moved across the CONUS throughout the month, sharp upper-level ridges popped up in between the troughs. The ridging drew warmer-than-normal air far to the north, with warm and cold anomalies migrating across the country as the month progressed (temperature anomaly maps for weeks 1, 2, 3, 4, 5). Averaged over the month, the lows and troughs (below-normal 500-mb heights) dominated east of the Rockies, with above-normal heights over the Northwest. A weakened North Atlantic (Bermuda) subtropical high went along with the dominance of troughs and upper-level lows in the eastern CONUS, while a slightly stronger North Pacific High was associated with the upper-level ridging in the Northwest. The migratory nature of the upper-level systems tended to average out the monthly temperatures. May temperatures averaged cooler than normal from the Southwest to Northeast in association with the below-normal upper-level heights, but only four states were cooler than normal on a statewide basis. Likewise, temperatures averaged warmer than normal in the West and Southeast, but only nine states were warmer than normal on a statewide basis. No state was much warmer or cooler than average. When averaged across the CONUS, May ranked only 55th warmest. Some of the potent cold fronts brought much cooler-than-normal air behind them (temperature anomaly maps for weeks 1, 2, 3, 4, 5). That, and cloudiness and rain associated with the closed lows, kept daily temperatures low, while the clear skies and southerly flow associated with the upper-level ridging brought warm daily temperatures. When integrated across the month, there were 3,381 record warm daily high (1,187) and low (2,194) temperature records. This was just a little more than the 3,007 record cold daily high (1,973) and low (1,034) temperature records. The REDTI (Residential Energy Demand Temperature Index) for May 2017 ranked near the middle of the 123-year historical record for May at 58th lowest. This was due to the mixed pattern of above- and below-normal temperatures and the time of year. Below-normal monthly temperatures in the Northeast increased heating demand. Below-normal monthly temperatures in the southern Plains reduced cooling demand, but above-normal temperatures in parts of the Southeast increased cooling demand. And these heating and cooling demand anomalies varied by region and week with each passing cold and warm front. Some of the upper-level lows and their associated cold fronts had air that was cold enough for snow to form. About 10 percent of the CONUS was snow-covered as the month began. With the seasonal increase of temperatures, that percentage rapidly dropped to about 3 to 4 percent. At mid-month, a deep and slow-moving upper-level low pressure system, with its attendant cold front, pulled in below-freezing air which transformed the precipitation into snow across the central Rockies (snow cover maps for May 18, 19, 20). The national snow cover increased to about 8.5 percent on the 19th, but it rapidly fell as the system moved to the east and sunshine ate away at the snow cover. By the end of the month, the snow cover hovered around seasonal norms of about 2 percent. The Climate Extremes Index (CEI) aggregates temperature and precipitation extremes across space and time. The occurrence of slow-moving deep closed lows resulted in extremes of precipitation. However, the frequent passage of cold fronts followed by warm fronts and ridges in the variable circulation evened out the temperature extremes. Consequently, while some components of the CEI ranked high, when the components are aggregated together the regional and national CEI values for May 2017 did not rank in the top ten category. Specifically, the East North Central region had the most extreme wet spell component and the Northwest region had the sixth most extreme wet spell component. The South region had the fourth most extreme one-day precipitation component, as did the Southeast region, and the Central region had the tenth most extreme one-day precipitation component. 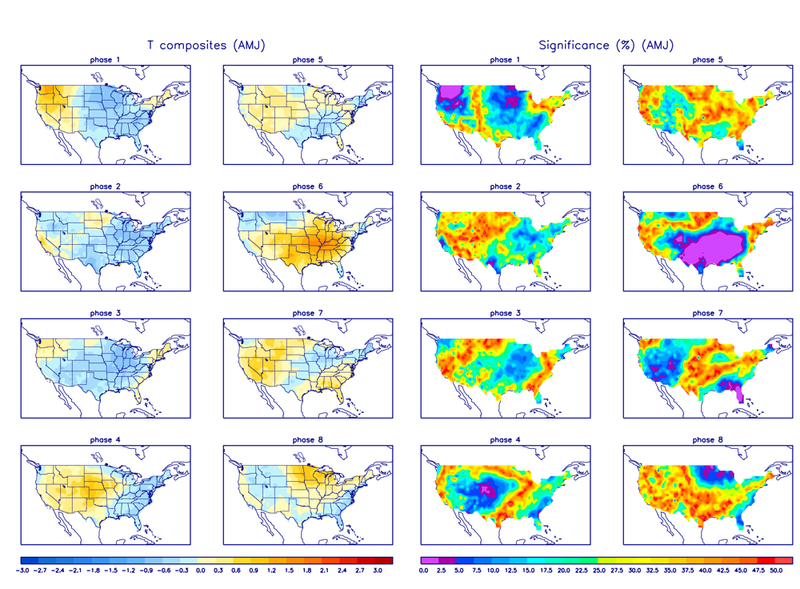 But the other components were not extreme enough to give any of these regions a top ten regional CEI. When aggregated across the nation, none of the national components ranked in the top ten category. The upper-level circulation pattern, averaged for the month, consisted of below-normal upper-level (500-mb) height anomalies over much of the CONUS east of the Rockies, resulting from troughs and closed lows frequently moving across the area, and above-normal height anomalies over the Northwest. There was a pronounced pattern of precipitation anomalies across the CONUS during May 2017, with wetter-than-average conditions dominating in southwest-to-northeast streaks from the central Plains to western Great Lakes, mid-Mississippi Valley to Northeast, and Lower Mississippi Valley to Southeast. The month averaged drier than normal across much of the West, northern Plains, southern Plains, and southern Florida. There was a mixed precipitation anomaly pattern across Alaska, especially for the high elevation (SNOTEL) stations; the low elevation stations were mostly wetter than normal. Hawaii had a mixed precipitation anomaly pattern, while Puerto Rico was mostly drier than normal. The dynamic and meridional upper-level circulation pattern brought a mixture of cold and warm air masses migrating across the CONUS throughout the month. Their cold and warm anomalies balanced each other out so that the monthly temperature averaged near the middle of the historical record. Warmer anomalies tended to dominate the colder anomalies over the northwest and southeast portions of the CONUS, while the month averaged colder than normal across the central to northeast portions. Alaska averaged warmer than normal in the west and north, and colder than normal in the southeast. Global Linkages: The upper-level (500-mb) circulation anomaly pattern over North America was part of a complex long-wave pattern that stretched across the Northern Hemisphere. The usual east-west trough/ridge pairs (or couplets) and anomaly couplets were evident from the eastern Pacific, across North America and the North Atlantic, to western Europe. But north-south coupling was also apparent in latitudinal bands across Asia. The above-normal 500-mb heights were associated with upper-level ridging at the mid-latitudes, below-normal precipitation (over northern Europe), below-normal snow cover (over parts of western North America), and above-normal surface temperatures over parts of North America and Eurasia, and in parts of the North Atlantic and North Pacific. The areas of below-normal 500-mb heights were associated with upper-level troughing; near- to below-normal surface temperatures over the the eastern CONUS and northern Asia and parts of the North Pacific and North Atlantic; above-normal precipitation over the eastern CONUS and northern Asia; and above-normal snow cover over northern Asia. Much of northern Asia was cooler than normal. But with large parts of the continents still having warmer-than-normal temperatures, and large portions of the Atlantic and Pacific Oceans having warmer-than-normal sea surface temperatures, the May 2017 global temperature was above normal. Status: ENSO-neutral conditions were present during May 2017 with above-average SSTs across most of the equatorial Pacific Ocean. Teleconnections (influence on weather): The NWS CPC has no teleconnections for ENSO-neutral conditions. However, to the extent teleconnections are known, the typical temperature and precipitation patterns associated with El Niño during May include above-normal temperatures in the Pacific Northwest, near-normal temperatures in the Southeast, and below-normal temperatures in between from the Southwest and southern Plains to the Great Lakes and Northeast. Comparison to Observed: The May 2017 temperature anomaly pattern is a very good match with that expected with El Niño. Even though the equatorial Pacific is technically ENSO-neutral, the SSTs were above average, which is consistent with an El Niño, and this may have resulted in some El Niño-like influence on the CONUS weather. Status: The MJO Wheeler-Hendon index began the month in phase 8 and transitioned to phase 1, then became incoherent (inside the unit circle), ending the month back out in phase 3. Other aspects of the tropical ocean-atmosphere system (referred to in the CPC reports as the background or low frequency state, Kelvin and Rossby waves, and tropical cyclone activity) appeared to play a role in influencing the month's climate (especially Kelvin waves) (MJO updates for May 8, 15, 22, and 29). Teleconnections (influence on weather): The MJO's temperature and precipitation teleconnections to U.S. weather depend on time of year and MJO phase. But there are no teleconnections for an incoherent MJO. Comparison to Observed: The MJO is transitory and can change phases (modes) within a month, so it is usually more closely related to weekly weather patterns than monthly. In the case of May 2017, however, the weekly (for week 4) and monthly temperature anomaly patterns match the teleconnections for phase 3 quite well. The weekly (weeks 1, 2, 3, 4, 5) and monthly temperature anomaly patterns don't seem to match the teleconnections for phases 8 or 1. 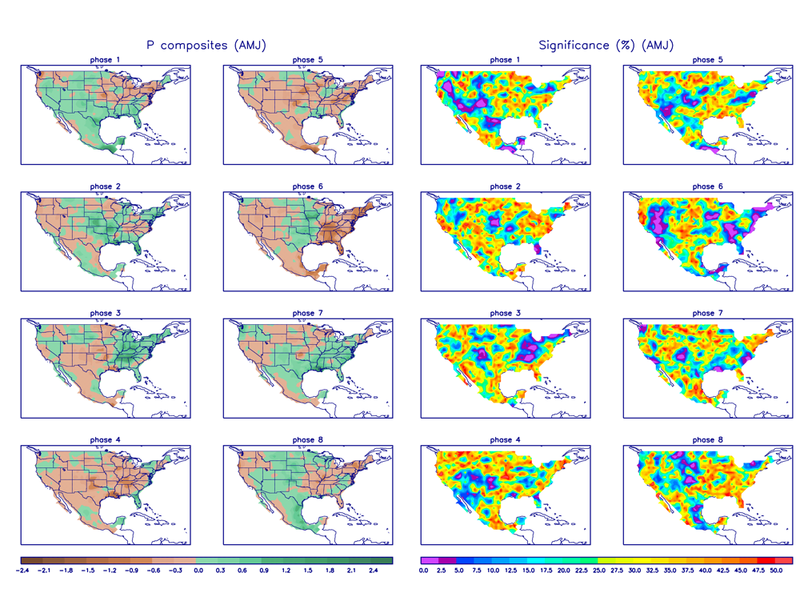 The weekly (weeks 1, 2, 3, 4, 5) precipitation anomaly patterns generally don't match the corresponding teleconnections for phases 1, 8, and 3, but the monthly precipitation anomaly pattern is a reasonable match for the phase 3 teleconnection. But the MJO was in phase 3 for only a short time near the end of the month, so the match may be a coincidence. Status: The daily PNA index was zero for most of the month, averaging near zero (only slightly negative) for the month as a whole. The 3-month-averaged index was near zero. Teleconnections (influence on weather): No temperature, precipitation, or upper-level circulation teleconnections are provided for a neutral (zero) PNA. Comparison to Observed: Notwithstanding that, the May 2017 upper-level circulation anomaly pattern has some similarity (although shifted) to the teleconnections for a positive PNA over the CONUS (but not over the North Pacific). Status: The daily AO index was negative for the first half of the month, then hovered around zero for the second half, averaging negative for the month. The 3-month-averaged index was slightly positive. Teleconnections (influence on weather): To the extent teleconnections are known, a negative AO in May (April-June in the AO Composites table) is typically associated with dry conditions in most areas east of the Mississippi River; spotty wet conditions in the Plains and West; below-normal temperatures from the northern Plains to New England; near-normal temperatures elsewhere across the CONUS; above-normal upper-level circulation anomalies over the Arctic Ocean extending into northern Canada; and below-normal upper-level circulation anomalies over northeast CONUS and southeast Canada, extending across the North Atlantic, and also over the North Pacific. Comparison to Observed: The May 2017 monthly upper-level circulation anomaly pattern has some similarities to the teleconnections for a negative AO over the Arctic and North America, but not over the Pacific. The temperature and precipitation anomaly patterns do not agree. Status: The daily NAO index was negative for most of the month, averaging negative for the month. The 3-month-averaged index was slightly positive. Teleconnections (influence on weather): To the extent teleconnections are known, a negative NAO during this time of year (April on the quarterly teleconnection maps) is associated with below-normal upper-level circulation anomalies over all of the CONUS and much of the North Atlantic; above-normal circulation anomalies over northern Canada to Greenland and Iceland; below-normal temperature anomalies across most of the CONUS except Texas and the Southeast; and wetter-than-normal precipitation anomalies in the Southeast, central Plains, and northern California (although few precipitation teleconnections exist). Comparison to Observed: The May 2017 upper-level circulation anomaly pattern is a very good match across North America and the North Atlantic, except it is slightly shifted over the CONUS (doesn't match that well along the west coast). The temperature anomaly pattern is a good match across the CONUS, except for the west coast. The precipitation anomaly pattern agrees with the existing teleconnections, except in the West (but few teleconnections exist). Status: The monthly WP index was slightly positive, as was the three-month average WP index. Teleconnections (influence on weather): To the extent teleconnections are known, a positive WP during this time of year (April on the quarterly teleconnection maps) is typically associated with above-normal temperatures from the Canadian Prairies to the Ohio Valley; below-normal temperatures over the southwestern CONUS; below-normal circulation anomalies over the southwestern CONUS and northeast Asia; and above-normal circulation anomalies over parts of the Pacific. Few precipitation teleconnections exist, but below-normal precipitation occurs over parts of the Pacific Northwest. Comparison to Observed: The May 2017 monthly upper-level circulation anomaly pattern shows some agreement over eastern Asia and the western Pacific, but not over North America. The temperature anomaly pattern does not agree. The precipitation anomaly pattern shows little agreement, but there are few teleconnections. Status: Compared to the previous month, the May North Pacific SSTs cooled along the North and South American coasts and into the central North Pacific. This reduced the warm anomalies in the eastern Pacific compared to April, but otherwise the net result was a continuation of the SST anomaly pattern consisting of cooler-than-normal SST anomalies between 30 and 50 degrees North latitude that stretched from near Japan to the North American coast, and warmer-than-normal SSTs north and south of this cool area. The average sea level pressure field and its anomaly field for May suggest that the Icelandic Low over the North Atlantic was stronger than normal, and the Aleutian Low over the North Pacific was a little stronger and a little further southwest than normal. These atmospheric pressure centers of action serve to both generate or intensify low pressure storm systems as well as reflect the migratory path of low pressure systems. The North Atlantic High (Bermuda High) was weaker than normal and shifted away from the eastern CONUS, while the North Pacific High was a little stronger than normal and shifted a little further northward in the eastern North Pacific. During May 2017, the upper-level circulation field consisted of below-normal heights, or enhanced troughing, over the eastern CONUS, the North Atlantic, and northern Asia, and above-normal heights, or enhanced ridging, over Europe, extending across the Arctic and Canada into the northeast North Pacific. The May 2017 monthly EP-NP index was negative while the 3-month running mean was near zero. Teleconnections (influence on weather): To the extent teleconnections are known, a negative EP-NP index this time of year (April on the quarterly teleconnection maps) is typically associated with warmer-than-normal temperatures across the CONUS from the Great Plains to East Coast; cooler-than-normal temperatures along the West Coast and over western Alaska; below-normal upper-level circulation anomalies (weaker upper-level ridge) over Alaska, western Canada, and the western CONUS; and above-normal upper-level circulation anomalies across eastern North America (weaker upper-level trough) and over the central North Pacific. The precipitation teleconnections are weak but suggest drier-than-normal conditions over Wyoming and the Ohio Valley. Comparison to Observed: The May 2017 upper-level circulation anomaly pattern agrees with the teleconnections associated with a negative EP-NP over Alaska and northeast Canada, but not over the CONUS or North Pacific. The temperature anomaly pattern is opposite that expected with a negative EP-NP. The precipitation anomaly pattern generally does not agree where the few teleconnections exist. Examination of the available circulation indices and their teleconnection patterns, and comparison to observed May 2017 temperature, precipitation, and circulation anomaly patterns, suggest that the weather over the CONUS in May was traced mostly to atmospheric drivers originating in the North Atlantic Ocean and possibly the equatorial Pacific. The PNA index was near zero, indicating little influence, and the patterns did not match the teleconnections for the AO, WP, and EP-NP, suggesting that these Arctic and North Pacific drivers also had little influence. There was good agreement between the anomaly patterns and NAO teleconnections, which indicated that the North Atlantic drivers had the strongest influence. But the anomaly patterns also suggested the equatorial Pacific might have had some influence. Even though the tropical Pacific was technically in an ENSO-neutral state, the SST anomaly pattern reflected what might be expected with an El Niño and the observed temperature anomaly pattern matches that expected with an El Niño. The monthly temperature and precipitation anomaly patterns also match those expected with a phase 3 MJO. This month illustrates how the weather and climate anomaly patterns can be influenced by atmospheric drivers (or modes of atmospheric variability) originating in the mid-latitudes (North Atlantic) and possibly equatorial Pacific. NOAA National Centers for Environmental Information, State of the Climate: Synoptic Discussion for May 2017, published online June 2017, retrieved on April 24, 2019 from https://www.ncdc.noaa.gov/sotc/synoptic/201705.